Home › News & Articles › Reports › Vermeerbergen-Wilms (Mol, BE) claim a 1-2-3-4-5-6-7-8…. from Momignies! Vermeerbergen-Wilms (Mol, BE) claim a 1-2-3-4-5-6-7-8…. from Momignies! 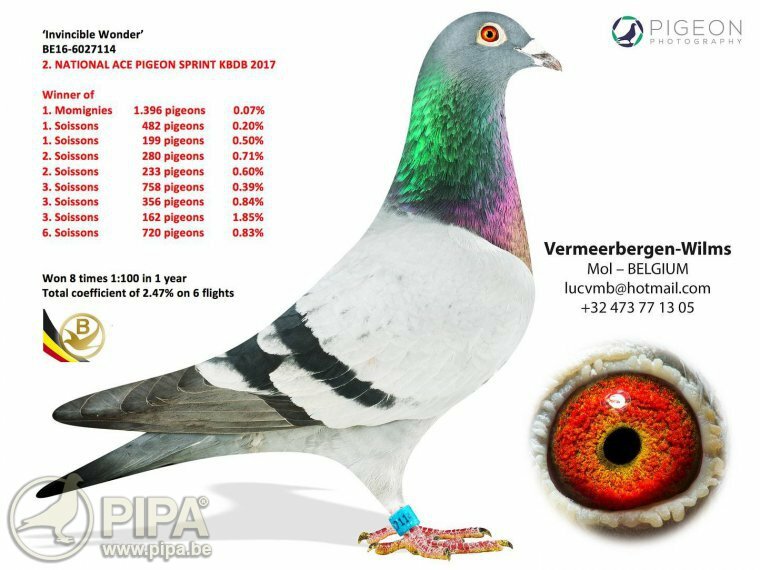 We go back in time to 1995 and the national race from Châteauroux, where team Vermeerbergen-Wilms caught pigeon fanciers across the globe in amazement, winning a 1st, 2nd, 3rd and 4th national of more than 10,000 pigeons! It goes without saying that Vermeerbergen-Wilms has had some miraculous results over the years. And that is because this team has some truly unique racing birds in in its ranks. Time for an overview. We start off with Invincible Wonder (BE16-6027114). 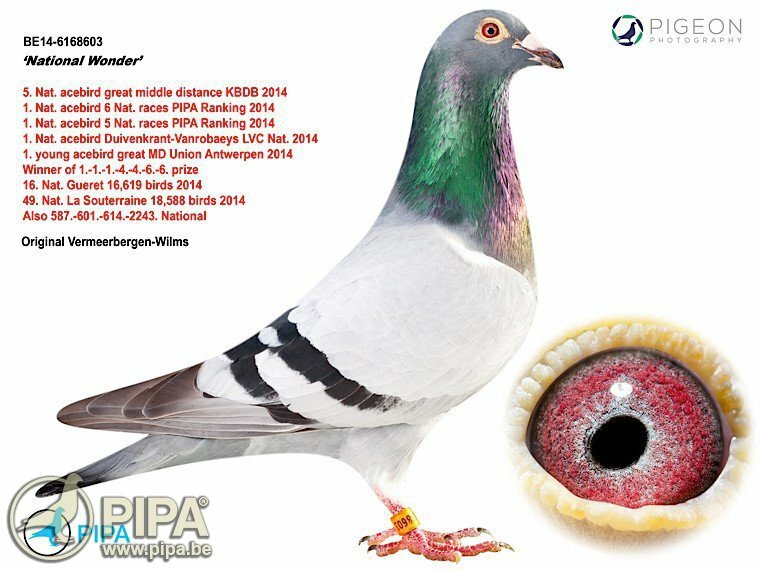 This champion won the title of 2nd National Ace Pigeon sprint in 2016 with an impressive 8 prizes 1/100 in a single season. 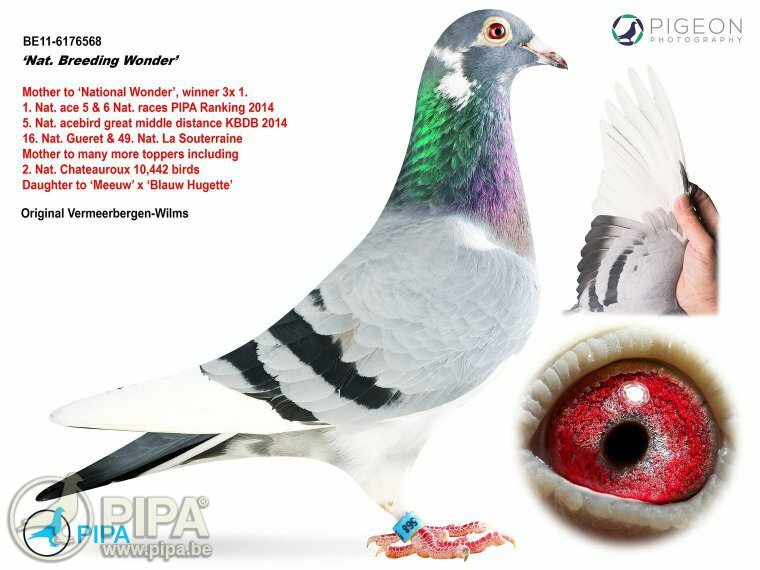 The second star of the team is National Wonder (BE14-6168603), and she was the best young bird of 2014 across 5 and 6 national races in the PIPA ranking. She also won a title of 5th National Ace Pigeon, with a 16th Nat. Gueret and a 49th Nat. La Souterraine to her name. The dam of this National Wonder is Nat. Breeding Wonder, the team's stock breeder. She has bred several prize winners, including the 2nd national Chateauroux. Click here for her full pedigree. It is no coincidence that he originates straight from Invincible Wonder x Nat. Breeding Wonder. Click here for the pedigree of this upcoming star. Luc and Robby clearly have their team up and running for the national classics from Châteauroux, Bourges and Argenton, and as you know, anything can happen now. This combination would not mind delivering another fabulous result. Good luck!